It may not always seem like it, but employees really do want to learn and grow at work. In fact, nearly three-quarters of employees feel that lack of training is the biggest hurdle that stands in the way of achieving their full potential at work. So why, then, aren’t employees using your learning resources more? A recent study by LinkedIn on workplace learning showed that most employees simply don’t feel like they have the time for learning. And if employees aren’t finding the time to learn, then learning and development (L&D) programs aren’t going to be as successful as they could be. That’s why today more and more L&D leaders have made it a top priority to help their employees make time for learning. Of course, simply adding hours to the work-day isn’t exactly an option, and typically, neither is removing responsibilities from each employee’s already-heavy workload. So how can L&D strategies change to help employees find more time to learn? More than half (56%) of employees surveyed by LinkedIn say that they would spend more time learning if their manager directed them to complete a specific course to gain or improve their skills. That means that the easiest way to get employees to spend more time learning is to get their managers involved. While your people may already be motivated to make a change, often it’s that extra nudge or reminder from a manager that ensures learning doesn’t get pushed aside (or simply forgotten) in lieu of other projects. Managers will have the best understanding of individual employee goals and activity levels, which puts them in a unique position to help set long-term goals and help learners find moments here and there that they can safely spend learning new skills. To do this, managers need both direction and data. Adding training and development goals into both formal and informal review processes will help create a culture in which learning will be top-of-mind for both managers and their direct reports. And because “what gets measured gets managed,” still holds true, providing managers with the performance data and analytics from your learning management system (LMS) or video platform will help those leaders coach their employees around both past and future learning activities. Your people are busier than ever. That means your learning resources need to be both available and easy to find, either for when employees do make time for training or for all those unplanned moments when they realize they need specific training-related information. That means that organizations are working harder than ever to build flexible learning ecosystems that support just-in-time learning that can be accessed from anywhere, on any device. Of course, no two learning ecosystems are alike, but there is one similarity that has emerged recently among top learning organizations — they’ve built learning ecosystems that include on-demand video content that helps both to improve engagement with formal learning and to scale informal learning across teams and locations. On-demand formal learning videos. Try as you might to find the perfect time, not everyone will be able to make it to your formal training sessions or lunch and learns. So while in-person instructor-led training will likely always continue to be one of your most valuable training methods, remembering to record your live training sessions and making them available on-demand will help you ensure every one of your employees will be able to learn from those presentations. Microlearning videos. Microlearning videos offer employees the ability to learn something new in a short amount of time. Usually under ten minutes in length, microlearning videos can be intentionally created by your instructional designers from scratch, or can be created by cutting up longer training presentations and classes into shorter segments. These bite-sized learning videos are quick to produce and actually help employees retain new skills training better by not overloading viewers with more information than they can remember. Social learning at scale. With more employees working in fluid environments — whether it’s flexing time in the office and working remotely, or global teams operating across different time zones — opportunities for social learning may be much harder to find than they once were. With a video platform, though, you can capture the collective institutional knowledge of your workforce and turn it into a learning resource for all your employees. Simply have your employees record their knowledge in short tutorial videos and share them in your searchable video library. Soft skills training video podcasts. The beauty of a video podcast is that it’s engaging and it keeps employees coming back for more with new episodes each week or month. L&D teams are beginning to leverage this popular medium for delivering soft skills training in a way that doesn’t make employees feel like they’re sitting through lecture after lecture. A video platform simplifies using video for learning, making it possible for anyone with the right permissions inside an organization to record, edit, share, and search video knowledge resource. And by integrating a video platform into your other learning systems, you ensure your entire video library can be accessed where your people already go to get and share information. 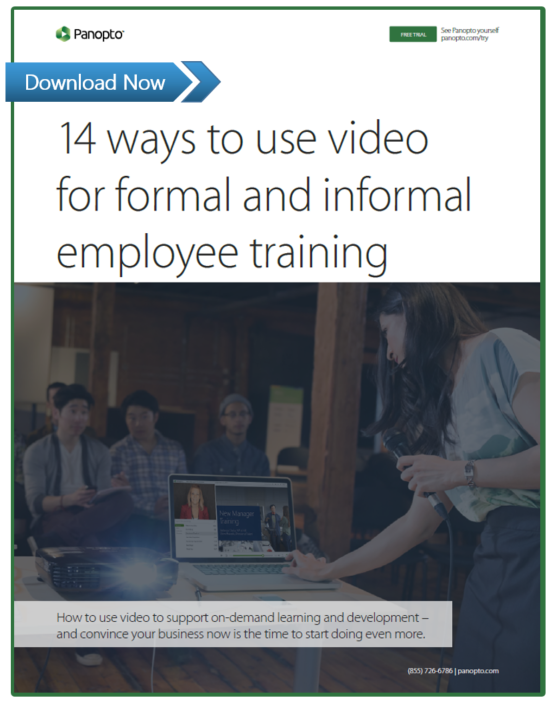 In our complete white paper, 14 Ways to Use Video for Formal and Informal Learning, we help L&D practitioners make the business case for doing more with video. In it, you’ll learn about the 5 benefits that help convince your decision makers to use video in more ways for L&D, 14 ideas for supporting and scaling formal and informal learning with video, and 1 technology — the video platform — that simplifies the use of video for learning.